Located in the the heart of Osage Beach, at the 20.5 MM at THE LEDGES, and within minutes of restaurants, nightlife, shopping, and a choice of the area's finest golf courses. The Ledges offers two pools (one on the point with a fantastic water view),and a sandy beach with volleyball pit and swim platform. Holiday weekends often see entertainment at the point pool for social gatherings. Boat Slip available. This unit is on the first level(very few steps), and overlooks the cove. It's easy to keep an eye on the kids from the deck, which overlooks the pool and swim beach. The deck features a gas grill and comfortable furniture in which to relax and enjoy the great view and fantastic sunsets! Inside are two bedrooms, each with its own bathroom and cable TV. Plenty of towels and linens are provided for your convenience. 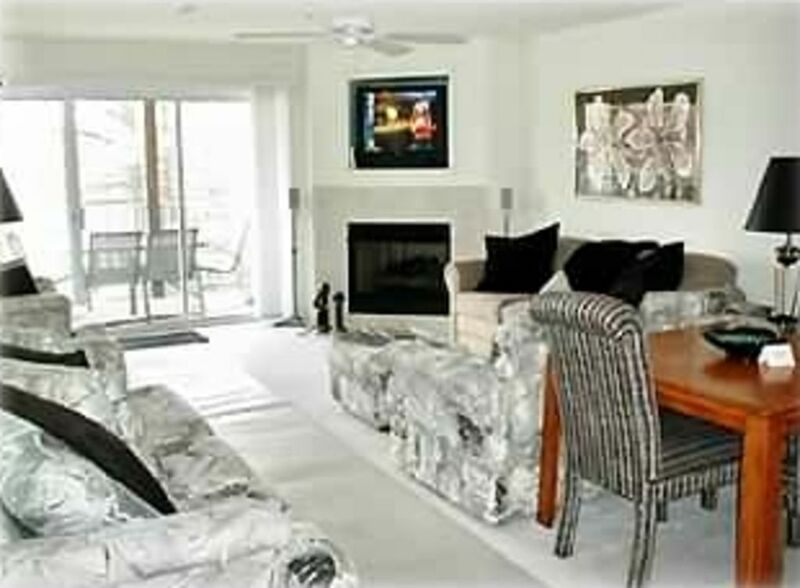 The living area has two couches (one pulls out for sleeping), a TV built in over the gas fireplace, and a surround sound system, decorated in contemporary decor. The kitchen is fully equipped with coffee maker, ice maker, microwave, and cooking utensils and pots and pans are available for the chef! The full size washer and dryer are especially handy for those week long stays! Quiet hours are strictly enforced from 11 PM to 7 AM. Please, no pets or smoking are allowed, as we would like to keep our condominium clean for your next vacation! seen from our balcony, less than a 5 minute walk from our condo. propane. can be tricky to start. dishes, serving bowls and utensils, mixing bowls, etc. dinnerware, glasses, silverware, utensils, pots and pans, crock pot, wine cooler, coffee maker, toaster, etc. some items are in cupboard over fridge. The condo was great, mattresses were comfy, and everything was very clean. The only reason this review is 4 stars and not 5 is because we had trouble contacting the owner to get check in information. We finally got a call back 30 mins before we were supposed to check in, which was a little too close for comfort. I would suggest to the owner to print a checkout checklist detailing what we are supposed to do with towels, stripping beds, etc. to avoid us being find for anything. Overall, the vacation was great and I would rent this condo again. We had a great time. Love the access to the lake and the beach area. Very clean and spacious. We will be coming back for sure! Very clean and well maintained. Convenient to pool and beach, and to highway to get to restaurants. Great place! My wife, two girls (7 yrs and 13 yrs) and I had such a good time that we stayed a day longer than orginally planned. Property is right next to the pool, which is very family friendly. Small beach about 100 yards down from the pool. Docks to fish off of and located convient to lake access, boat rental and shopping mall. We had a great time! Sue was very polite and easy to work with. Spent four nights at the condo with our family. We really enjoyed being able to have the comforts of home with the kitchen and grill. Both bedrooms were spacious and comfortable. The guys enjoyed the close proximity of the golf courses and the girls enjoyed the outlet mall. The close proximity of the pool was nice. Everyone we met at the Ledges was very nice. We also appreciated the security provided. Would highly recommend and have recommended to our friends. We just returned from a long weekend at the lake, and it couldn't have been any better! The condo is very nicely furnished and decorated...we didn't feel like we were "roughing it" at all. We brought much of our own food and found the kitchen to be well-stocked with supplies, and the layout of the condo was well suited for two couples. We enjoyed the fact that everything was nearby...boat rentals, golf, shopping, restaurants, putt-putt, etc. The Ledges was a well-maintained complex, and we were surprised by the consistent friendliness of other vacationers. We would definitely consider returning! Thanks to Keith and Lisa for being so organized, detailed, and easy to work with! Osage Beach is a resort town with amenities for everyone, regardless of age. We are centrally located. 6 nights/$800 Memorial Day, Fourth of July and Labor Day require 3-night stay.